You might have seen the sneak peeks on Instagram? Today we’re releasing our three new Sutton styles! 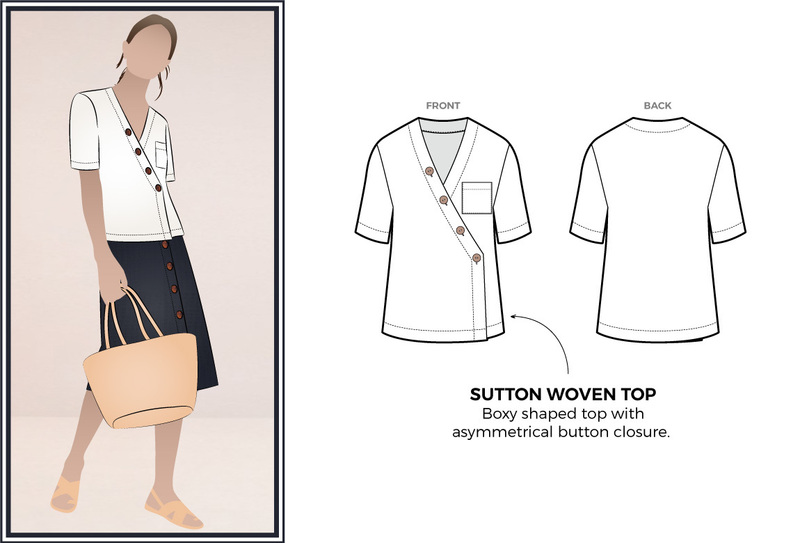 The Sutton Woven Top (Paper, PDF, Etsy), Sutton Woven Cami (Paper, PDF, Etsy) and Sutton Skirt (Paper, PDF, Etsy). 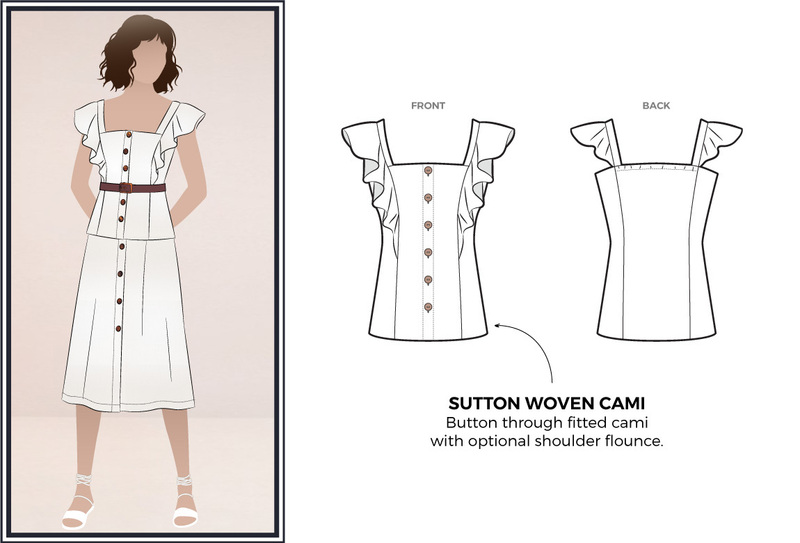 Both the cami and the top work perfectly with the skirt to create two very different looks. Read on to find out more! The easy, breezy Sutton Woven Cami is a gorgeous summer top and a great update for your wardrobe. With its optional flounce to sit over the shoulder strap, you can create two very different looking tops. We have added a partial elastic back which allows for a great fit and extra comfort. Why not get creative and use decorative buttons to personalise your top? The Sutton Woven Top is a very different look. Make a statement with this on-trend, loose fitting top using a decorative button or fastening on the asymmetrical closer. With its single pocket the Sutton Woven Top will become a go-to staple that can be worn casually or dressed up with ease. This Sutton Woven Skirt, with its self-made belt, can be worn with the cami or the top for two different looks. This is Style Arc’s interpretation of the skirt of the moment; a classic mid length, slightly A-line skirt. Use feature buttons and a matching buckle to set this skirt apart. Do you use social media? Instagram? Facebook? Pinterest? Do you blog about your sewing? If so, we want to know about it! We just love seeing your fabulous Style Arc sewing creations. Don’t forget to tag us in your photos, use the hashtag #stylearc, or just email your photos through to us. It really does make our day seeing your sewing talent shine!